It is soft-cover of 64 pages in 11 1/2" x 8 1/4" page format. The cover art shows a Tamiya 1/35th scale M4A3E8 Sherman by modeler Marcos Serra, fitted with a 76 mm gun, a common conversion within 2nd Armored Division. The pictures in the center (left to right) are of soldiers of the 60th Infantry Regiment with a supporting M4 75 mm tank of the 746th Tank Battalion photographed in Belgium in early September 1944. A close up view of the extended end connectors, colloquially know as Duckbills, fitted to Sherman's tracks. M4A1 76 mm armed tans of 2nd Armored Division photographed in France in July 1944. At the bottom is a color profile of a M4A3E2 Assault Tank of 15th Tank Battalion, 6th Armored Division. The back cover has at the top a black and white photo of a heavily camouflaged M4A3 76 mm tank of the 709th Tank Battalion photographed near Colmar in France on 31 January 1945. Over a color photo of detail of the Hobby Boss 1/48th scale M4A3 75 mm built with the Eduard Model Accessories brand PE brass set. Over a color photo of U.S. Army tanks, including the M4A1 closest to the camera, fitted with deep wading stacks and loaded aboard a Landing Craft Tank (LCT) just prior to the Normandy invasion. At the bottom is a M4 105 mm howitzer of Headquarters, 15th Tank Battalion , 6th Armored Division. This is a color profile shown and described on page 23 of the book. The book contains 102 color photos of Sherman tank models made up (counting the books covers). There are 56 black and white photos. 2 maps and 3 organization breakdown charts. There is detailed design and operational history of the Sherman tanks operated by U.S. forces during the campaign in north-west Europe. Details of variants and modifications made in production and in the field. Color reference for paint schemes and markings. 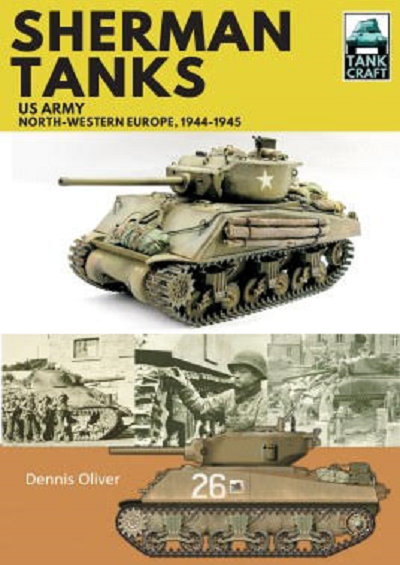 Following his first book in the Tank Craft series on the British Army's Sherman's during the battle for Normandy, Dennis Oliver has compiled a companion volume on those used by the U.S. Army throughout the campaign in Western Europe. These were the tanks that made up the bulk of the American armored forces that swept across occupied France and advanced into Hitler's Germany. Wartime photos and carefully researched, exquisitely presented color illustrations show in detail the types of Sherman - including the main variants - that played a vital role in Allied operations. As with all the books in the Tank Craft series, a section of this work displays available model kits and aftermarket products, complemented by a gallery of beautifully constructed and painted models in various scales. Technical details as well as modifications introduced during production and in the field are also explained. This book will give the modeler all the information and knowledge required to recreate an authentic miniature representation of the most famous American armored vehicle of WWII. Dennis Oliver is the author of over twenty books on WWII armored vehicles, including "Codename Swallow: British Sherman Tanks at Alamein", "To the Last Bullet: Germany's War on 3 Fronts", "Westwall: German Armour in the West, 1945", "Viking Summer"and "A Sound Like Thunder".